GAGAN provides a civil aeronautical navigation signal consistent with International Civil Aviation Organization (ICAO) Standards and Recommended Practices (SARPs) as established by the Global Navigation Satellite System (GNSS) Panel. The GAGAN system provides non-precision approach (NPA) service accurate to within the radius of 1/10th of a nautical mile (required navigation performance or RNP-0.1) over the Indian FIR as well as precision approach) service of APV-1.0 (APproach with Vertical guidance) over the Indian landmass on nominal days. The system is interoperable with other international SBAS systems such as the U.S. Wide Area Augmentation System (WAAS), the European Geostationary Navigation Overlay Service (EGNOS), and the Japanese MTSAT Satellite Augmentation System (MSAS), and provides seamless air navigation across regional boundaries. 5. A data communication subsystem —two optical fiber communication (OFC) circuits and two very small aperture terminal (VSAT) circuits. The following sections describe each element in greater detail. INRES – Indian Reference Station. The INRES stations collect measurement data and broadcast message from all the GPS and GEO satellites in view and forward them to the INMCC for further processing. The 15 INRES stations are established at Ahmedabad, Bangalore, Jammu, Guwahati, Kolkata, New Delhi, Port-Blair, Trivandrum, Jaisalmer, Goa, Porbandar, Gaya, Dibrugarh, Nagpur and Bhubaneshwar. INMCC – Indian Master Control Center. The data collected by each INRES across the country are transmitted to INMCC in real time (every second) and processed for the generation of correction and integrity parameters,in the form of SBAS messages. The generated SBAS messages are sent to INLUS for further processing. INLUS – Indian Land Uplink Station. The INLUS receives the SBAS messages from INMCC, formats them for GPS compatibility and uplinks the SBAS messages to GEO Stationary satellite for broadcast to the user community. The SBAS messages contain information that allows SBAS receivers to remove errors in the GPS position solution, thereby allowing for a significant increase in location accuracy with reliability. Along with the corrections, the confidence parameters (integrity) are also computed and provided to the users as messages. The messages are up linked in C-band to GSAT-8/GSAT-10 GEO satellite through Indian Land Uplink Station (INLUS) which are down linked in L1 & L5 band to the users. The broadcast messages are used by SBAS compatible receivers which compute its position while applying corrections over GPS signals. GEO Satellite. ISRO is responsible for providing GEO Satellites (SPACE segment) to the GAGAN program. 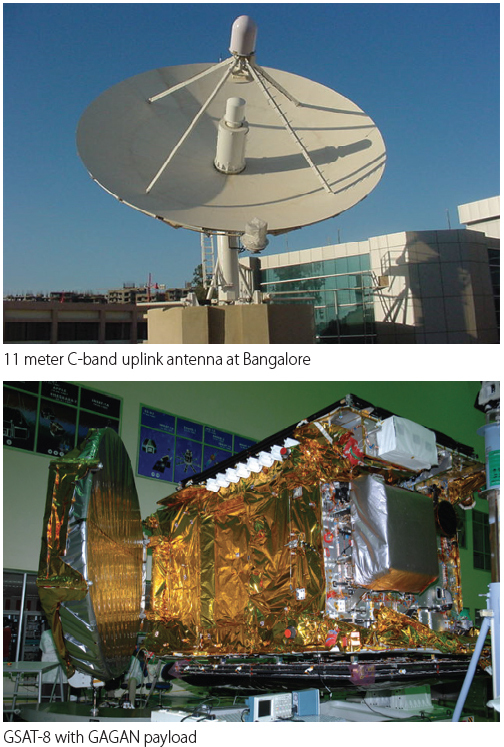 Three GEO satellites GSAT-8 (see accompanying photo, above right), GSAT-10, and GSAT-15 carry the GAGAN payload. GSAT-8 (located at 55 degrees East) and GSAT-10 (83 deg East) are already transmitting GAGAN SIS (Signal in Space) with PRN127and 128. The GSAT-15 carrying the GAGAN payload is stationed at 93.5 degrees East and has been allocated PRN132. Figure 2 provides a schematic overview of the GAGAN final operational phase (FOP) configuration. Figure 3 shows the coverage area of GAGAN signals. The ionospheric behavior over the low-latitude Indian regions is not quiet and is characterized by such features as scintillation, plasma depletion, large-scale energy density gradients, and so forth. To ensure optimal performance of GAGAN, ionospheric irregularities must be detected and the statistical confidence bounds adjusted accordingly. Need for a Region-Specific Model. To meet the required GAGAN performance, development and implementation of the best suitable ionosphere model were needed, a model that would be applicable to the Indian region. Moreover, preferentially the selected ionosphere-model algorithm should not call for changes in the existing SBAS message structure because any changes in the ICAO Minimum Operational Performance Requirements (MOPS) for GPS/WAAS airborne equipments-DO-229 would require agreement among all member states. Certifying GAGAN system with MOPS changes would have been a very time-consuming process. In constructing the model, grid ionosphere vertical error (GIVE) confidences must bind the errors not only at the ionosphere grid points but also for all interpolated regions between the grid points. Moreover, the error bound must be valid for both the nominal and the disturbed ionosphere. In order to capture large-scale features of the equatorial ionosphere anomaly, the model must provide an approach to overcome the inadequacy of the thin shell model (of electrons) over equatorial regions and capture the complex three-dimensional nature of the equatorial ionosphere. upon safety certification, be able to support operationally useful availability of vertical guidance in the service area over the landmass of the Indian FIR. ISRO GIVE Model – Multi Layer Data Fusion (IGM-MLDF). In order to model the vertical movement of the ionosphere, the IGM-MLDF Model is designed to capture the ionosphere variability at two different ionospheric electron shell heights and finally provide a value for the user at a 350-kilometer shell height using a weighted average method. The model ensures that the broadcast GIVEs have a sufficiently high level of integrity so that the user ionosphere vertical errors (UIVEs) computed by user receivers will bound their vertical ionosphere errors with a very high probability. The GIVE guarantees the integrity of UIVEs, not only at the grid point but at all points of the four grid cells surrounding the grid point. The algorithm provides the delay and the confidence values for the user, resulting in improved accuracy and availability. The algorithms were analyzed and reviewed, and performance of each of these was examined based on exhaustive studies carried out using INRES and total electron count (TEC) data over Indian region (Figure 4). Several nominal and storm (disturbed ionosphere) days were selected and the performance of the candidate algorithms was tested on these days. A down-selected IGM-MLDF algorithm was further improved through extensive review by expert teams aiding in a series of performance enhancements followed by an extensive analysis to tune parameters in the algorithm and determine the achievable accuracy, availability, continuity, and integrity of GAGAN service. The key function of the algorithm is to compute the delays and confidences (fit error) at various shell layers and combine them at 350 kilometers, which does not require any MOPS changes. This model is incorporated into the main GAGAN operational software by M/S Raytheon to compute and provide ionospheric corrections and integrity factors needed to meet the APV requirements. Regular performance evaluation is a key activity to estimate a system’s utility, effectiveness, and suitability to meet the desired requirements. Figures 5 through 9 provide a few snapshots of performance monitoring of GAGAN. To obtain a preliminary assessment of GAGAN performance, a dynamic flight test was conducted between Hyderabad and Bangalore (Figure 10) using a GAGAN receiver on board an ISRO aircraft. Figure 11 shows the configuration of the GPS and SBAS antennas on the fuselage of the aircraft. The GAGAN receiver data was analyzed to evaluate the position accuracy of the aircraft in kinematic environment at every one-second epoch and to verify the GAGAN SIS performance with respect to the required level of service. Based on the differential GPS (DGPS) and GAGAN data, the accompanying plots show the position accuracy along the flight path (Figure 12) in East (Figure 13), North (Figure 14) and Up (Figure 15) components. The horizontal protection limit (HPL) and vertical Protection Limit (VPL) were computed from the GAGAN data recorded during the flight test at every epoch. 1. The accuracy of GAGAN along East with reference to the truth (DGPS East reference) is less than 7.6 meters, 100 percent of the time, which is within the GAGAN performance requirement for all the sorties. 2. The accuracy of GAGAN along North with reference to the truth (DGPS North reference) is less than 7.6 meters, 100 percent of the time, which is within the GAGAN performance requirement for all the sorties. 3. The accuracy of GAGAN along Up with reference to the truth (DGPS Up reference) is less than 7.6 meters. 4. The position standard deviation of latitude, longitude, and altitude were found to be less than 4 meters, which indicates that the position accuracies of the GAGAN are well within the 7.6-meter requirement. The Director General of Civil Aviation (DGCA) formed a Technical Review Team (TRT) to examine specific safety-related artifacts and hazard records and to provide recommendations for resolving any observed issues. AAI had engaged the MITRE Corporation to support the certification effort. A two-step certification decision was adopted for GAGAN implementation. The TRT reviewed the integrity-related artifacts and hazard records and recommended the findings to the certifying authority (DGCA) for certification. A Hazard Review Board analyzed and reviewed the effect of software and hardware changes recommended by the TRT on system performance, and cleared GAGAN for certification. The system and facility certification process was completed with joint inspection and review of all ground-based installations and documentation, as well as the system safety and environmental management processes. A team comprising members from DGCA, AAI, and ISRO conducted the inspection. Initially, the DGCA certified GAGAN for en route operations (RNP 0.1) on December 30, 2013, and subsequently on April 21, 2015, for precision approach services (APV 1). APV1-certified GAGAN signals are being broadcast since May 19, 2015. By adopting GAGAN for aviation, flight delays, diversions, and cancellations (DDC) will be minimized, while reducing controlled flight into terrain (CFIT) incidents by 75 percent. In addition, India’s new SBAS enables direct flight paths and reduction of separation minima, which will ease the workload for pilots and controllers. Further, GAGAN facilitates enhanced oceanic air traffic control in areas where a ground-based navigation system is unavailable. Also, shorter direct flight paths enabled by GAGAN lead to time and fuel saving. Consequently, decrease of emission of greenhouse gases due to shortened flight paths results in reduction of air pollution. At the same time, flexible flight paths enabled by SBAS makes route deviations due to adverse weather uncomplicated and also enables reduction of aircraft-related sound effects in noise-sensitive areas. GAGAN is an enabler for low cost regional airports and will usher in greater connectivity to India’s fast-growing aviation market. Although primarily intended for civil aviation, the GAGAN signal can be used by a wide range of civilian and non-aviation users. Across the Indian subcontinent, GAGAN will provide benefits beyond aviation to many other user segments, such as intelligent transportation, maritime, highways, railways, surveying, geodesy, security agencies, telecom industry, location-based services for consumers, and so forth. We note that India is the fourth country in the world to implement an SBAS system for civil air navigation after WAAS, EGNOS, and MSAS. India has become the third country in the world to have APV-1 precision approach capabilities, and the first SBAS system in the world to serve the equatorial region. The GAGAN system is interoperable with other SBAS systems and will offer seamless navigation in the region bridging the gap between Europe and Japan. This article is made possible through the support and contributions from ISRO, AAI, DGCA, Raytheon engineers, TRT review committee members, SIS Validation test team, MITRE, and other industry partners who have worked for realizing the GAGAN system.